Giving children a sense of where they came from, the struggles and successes of those who came before, binds them to the community in which they live. To that end, having a museum where school children can go and learn about their culture allows them the opportunity to deeply understand those citizens who established the small townships and cities of central Minnesota. With this museum, the area school children would be able to do cross-age activities. Having the opportunity to partner Senior Citizens with students to discuss their oral history and witness those objects discussed in the conversation would be beneficial. Minnesota history is an essential part of the sixth grade curriculum. Seeing, learning, and understanding those that came before will empower children to carry these traditions and culture with them as they make their own history for generations that follow. 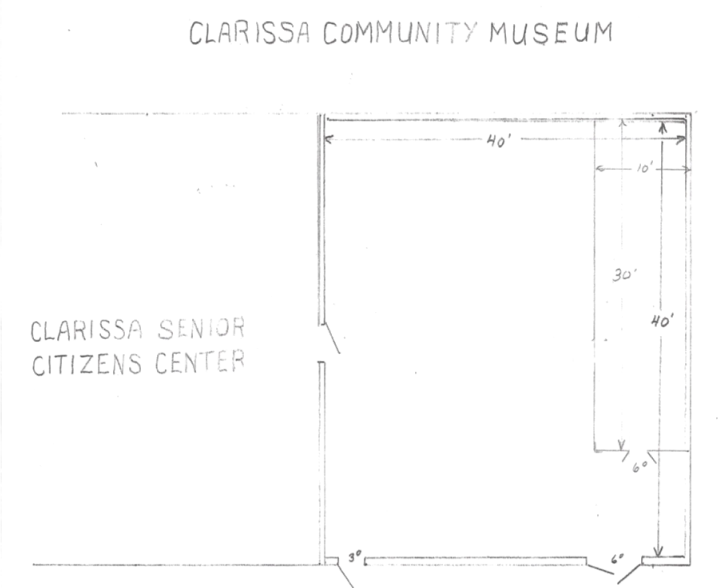 The Clarissa Community Museum, Inc. is a 401 (C)(3) organization which was formed to celebrate the history of Clarissa. The stories and displays are dedicated to the past, present, and future residents as the organization strives for the betterment and growth of the city and community. The museum is located at 402 Main Street West in Clarissa. The Museum is a 40‘x 40‘addition to the Clarissa Senior Center with a 10‘x 30 storage area. It presently has incandescent lights which can be harmful to light sensitive objects and does not provide adequate lighting for visitors to discover, explore and learn about our history. An improved lighting system could improve and protect the collection’s textiles, photos and paper from fading and other damage from overexposure to light and enhance the visitors experience viewing the collections. We are looking for a qualified electrician to bid on the renovation of the lighting. Previously a museum lighting designer evaluated our lighting areas and gave recommendations to update the lighting. For a copy of the recommendations and specs either email Gary Stracek at garyritastracek@gmail.com or call him at 320-594-2960. Bids are due on Friday, April 12. Building progress: The outside structure is completed. The infloor heating system has been installed. The cement floor will be poured this week.